Artwork © 2008, Jake Freivald. Click the image for a version that can be tiled for your computer’s wallpaper. She stared back mutely. That, at least, he didn’t blame her for: what could she say, after all? Any intrusion would only make things worse. He’d established the rules for this long ago, and she hadn’t fought back, which he considered as good as consenting. There was a little room for variation — maybe he would apologise, maybe he’d skip work and get drunk instead — but not so much, and not for her. “Wasting your time with... damn, you’re pathetic.” These days he found that most of his sentences went that way. It was hard to even vocalise the anger anymore, and all he had left was this stumbling shorthand. He’d meant the poster on the kitchen wall, a dramatically italicised print of Max Ehrmann’s Desiderata. It was cod wisdom, religion for atheists. It seemed to symbolise everything he despised about her; and the knowledge that those were the same things he’d once loved about her only worsened his rage. Every morning since she’d bought it he had come down to find her staring raptly at its trite, hollow sentences, more hypnotised than reading. He reached over and tore it from the wall, scattering drawing pins like shrapnel. In deft strokes he tore the glossy paper in half, and half again, and again and again, and rolled up the dismembered pieces into a ball, and tossed it into the waste paper bin. He felt sick and ebullient at once, fascinated and revolted by his own childlike ferocity. In his head, one voice was saying that’ll teach her, another what the hell are you doing? and he found that he couldn’t stand to listen to either. “Stupid,” he said again, almost to himself, and stormed out the back door toward his waiting car. He wasn’t surprised when he came home that night to find her gone. At first it simply didn’t occur to him, even as evidence mounted up: the bedroom in disarray, her clothes gone, her blue leather suitcase missing from its perch beneath the stairs. Then, when the truth became glaring and undeniable, he accepted it almost in a single instant, and — as would later seem astonishing, even revelatory — without a trace of anger. Instead, he felt literally deflated, as if one moment he were large and the next very small. She had left him. With that realization came sadness, too imprecise and short-lived to be the grief of loss. And though he wasn’t surprised to find her gone, the artifice of her leaving astonished him. On the kitchen table, spread like a patchwork quilt, were the torn fragments of the poster he had vandalized that morning. She had retrieved them and roughly reconstructed them. He could almost see her doing it, with the slow and methodical movements she’d adopted as she’d grown used to things breaking noisily around her. With the pieces roughly together, she’d begun her project. Like some ancient illuminator she had made the margins her own, with reams of notes that leaped and coiled around the central text. A couple of lines down, curling around Ehrmann’s As far as possible without surrender, she had picked out the last word and added, “No no no! Not anymore.” In the next paragraph, Enjoy your achievements as well as your plans met with “I have to achieve something before I die, before I die here, and I’ll never have been anything, not even me, and that CANNOT HAPPEN.” Along with these annotations there were also underlinings, encirclings, sections joined by dotted lines or highlighted with crude boxes, so that the reconstructed poster had come to resemble a student’s first scrawled essay, or a strategy for some desperate battle. In fact, it was neither of those things. It was a commentary, perhaps, a diary of a couple of hours of her internal life captured in minutest detail. It was a confessional. More than anything, it was an escape plan. Beside it was an envelope, with his name printed in neat black ballpoint capitals across its middle. Picking it up, he found that his hands were trembling. What was he afraid of? He was afraid she would hate him, that this last communication between them would be hateful. He understood suddenly that he wouldn’t be able to bear that. When he opened it, he breathed a sharp sigh of relief. It contained only a single scrap of the poster, neatly trimmed to hide the damage he’d inflicted. He remembered it as the last lines of Ehrmann’s poem. 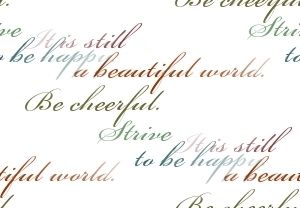 It read simply, Be cheerful. 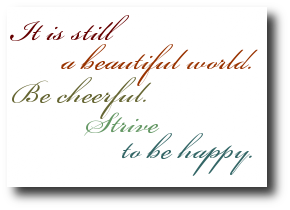 Strive to be happy. Stripped of context, it was neither trite nor hollow. It was a message from her to him, in her own words, her own voice. It was kind and generous, and contained some last vestige of love that he had somehow never managed to destroy. It was her forgiveness. And it was good advice. David Tallerman spent four years at York University studying English Literature, specializing in the literary history of witchcraft — an education that left him ideally suited to be an English teacher, a witch, or some unlikely combination of the two. Ever one to confound sensible expectations, he’s currently employed as an IT Contractor. Last year his stories appeared in Andromeda Spaceways Inflight Magazine, Pseudopod, and Hub amongst others; this year he has work out or forthcoming in anthologies from Hadley Rille and Night Shade Books, webzine Chiaroscuro and magazine Aoife’s Kiss. He can be found online at http://davidtallerman.net. Copyright © 2008, David Tallerman. All Rights Reserved.